In this fourth episode of listener’s comments, I address a question that is relevant to many business owners. 02:22 – What about an equipment upgrade? James Schramko here and this is a special podcast where I’m going to answer a listener’s question. And today’s question was posted by Belinda Parkes from 3psurfboards.com. On one of my other posts which was called, “What Will Break First”, that was a really important post because it’s a common thing that comes up often as we reach our limit in business. So, if you haven’t seen that post, “What Will Break First”, go and have a look at it on Superfastbusiness.com. I’m going to read you Belinda’s question and then I’m going to tell you some answers. Belinda said, “Hi! We operate a small surfboard manufacturing business in Newcastle, NSW. My husband is the surfboard designer and shaper. We have a machine that cuts out the foam for a computer design program. My husband, Paul, is an ex pro surfer and has extensive knowledge and skill in surfing. He finds it hard to get the time to blog and add content to his website. We are building a mag list of our customers so we can directly market to them. We manufacture only 12 boards per week, but have superior quality product to offer and find it tricky with limited funds and skill to know where to go next. We proved top surfers in Newcastle with surfboards as sponsorship. We provided top surfers in New Castle with surfboards as a sponsorship and are highly regarded in our community. Any advice would be great. I really enjoy the benefit from listening to your podcasts, they reaffirm a lot of our beliefs and teach us more!! Thanks Belinda and Paul”. Wow! I know that feeling. It sounds like Paul is doing just every job in that place. So, let’s have a look at the little components here. The first part is that, Paul is the designer and shaper. Now, I would say: Paul is it possible to train someone to shape? Or is it possible to train someone else to design- if you need new designs, or can you just rest on the designs that you’ve got and just hire someone to shape or take on an apprentice and grow the business that way. Because that would free you up to do some of the other cool stuff. Now, you’ve got a machine that cuts out the foam. Is it possible any way shape or form to get a second machine, or to make improvements to that machine to increase your capacity from 12 boards per week to a higher number. You could obviously go to 24 boards per week if you could get another machine, or maybe you can just get some improvements from the current one. The next thing I do is increase your prices. If you’ve got a great reputation, and you have got limited capacity and if you’re the only one who can design and shape the boards then probably, you could sell the boards for more, because they are special and generally, expensive equals good. So, raise your prices and see if there’s any resistance to that. Another thing is, I’d look for PR opportunities. You’ve got it going a little bit with your sponsorships of local surfers but see if you can reach a little bit further afield. See if you can get someone really famous using that board. See if you can put out a piece on why your boards are so special. What makes that design or the shaping so unique and if you can possibly just at least set up some lights and video the process. There’s so much you could do with the YouTube channel and people in that community will watch those things. They want to learn more about what goes into it. I’m not even a surfer. I do body surf but I watch documentaries about it. I’m fascinated with it, anything surf culture, skate culture, Dogtown boys is a great example of a documentary that involves that culture. Now maybe you can find someone in the surfing community who is a student or handy with writing, and they’d like to blog for you, or write articles for your magazine, or submit them with your name on it to other publications for printing. And this is a real tip here; get a professional photographer to come, maybe one of your community fellows or ladies has a nice camera. Perhaps the person who goes and takes pictures of the surf every morning could stop by the store and take really good high quality professional shots of you shaping the boards and making the boards, and build some legend around what you do. And then you could expand it to other things. If you’ve got that legendary brand, then you might be able to extend that to things such as fins or to t-shirts, or just some additional add-ons; even caps and stuff. I mean, when I have FastWebFormula 4, my live event, I ordered hoodies and people wear those hoodies for years later. They are a really valued piece of merchandise. They’re not that expensive to order, and you can certainly sell them for a markup. So get into some surf culture that supports your brand, that gets your logo out there a little bit further afield. And then send some of that merchandise to some really famous people and see if you can get them wearing something obscure. It’s kind of like a boutique beer that it’s actually more valuable when no one’s ever heard of it. Monday you might get a nice photograph in a big Time Magazine. Finally, if you can’t get someone to do the content for a low price or for free, you might just hire someone who’s a specialist to create articles and to extend the reach of your brand. Find out who is buying your boards right now. Where are they finding out about you and how can you go and get more just like that but perhaps in other communities, you’ll find out the perfect type of customer and target them specifically in the exact same way that you’re doing now but just do it in another geo areas. Maybe go on a field trip. Strap some boards onto the van and head down to Torquay or somewhere, or go up north to one of the Queensland places and get some repping. Get a little brand thing happening and document the whole journey with pictures and videos and upload them to your site. The community’s right into it. There’s actually a few people in SuperFastBusiness who are in this culture as well, so I’m sure you’ll be able to reach out to them and get some other ideas. I hope this is helpful. I’m sure your surfboards are awesome. And I’d love to see Australia sell a few more. So, thanks for writing in, Belinda and Paul, good luck. 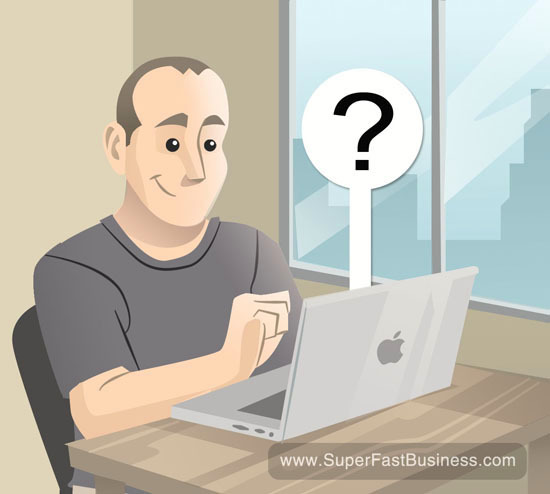 Now, if you’d like me to answer your question, be sure to post a comment on one of my posts at Superfastbusiness.com, or leave me a voice message on my player message in an upcoming listener comment’s episode. Paul is offering a service (customised surf boards). Yes, James’ suggestions are great but probably the only way to really leverage is to turn a service into a product (in your example say 6 specific board designs). Only with a product can you design systems so that you have a surfboard manufacturing company (with staff), as opposed to a surfboard design company. But if this is too hard in the short term (*and not your business model as having a unique design is likely a large part of why you have business), you will just need to join all the clever professional such as doctors, lawyers, accountants and tradespeople who trade dollars for hours, and once they stop working their business income stops. The only other way to create a product is to teach others, similar to James’ model – an internet course doesn’t cost much to ship. Belinda & Paul – get onto your local Enterprise Connect business advisors. They can provide government funding to help you out across many aspects of your business! Hi James, I really liked your suggestions for the surfing business and thought you might have some ideas for me and my biz partner. We have a website that offers e-products to runners to help them prevent and fix running injuries and also to help them improve their running so they can get more out of their sport. I am a sports injury therapist and we use my knowledge and our history as runners to build authority through our readership. We have a fairly extensive blog with two lengthy articles posted each week and a catalog of educational videos on there also. In the year or so that we have been in business we have developed a good level of respect in the running scene. When we release a new product (ebook or video) we tend to sell a few copies through promoting them on facebook and through our mailing list (which is not very big) but after the initial few sales it drops right off. Can you make any suggestions for how to broaden our reach in the running community or to increase and sustain sales? Thanks James, your advice is much appreciated. Shaun yes – I can post about this in an upcoming episode thank you. I have interviewed someone in this space. You will like that.